Music has ceased forever in Scudder's balcony, not because of rain but of fire. 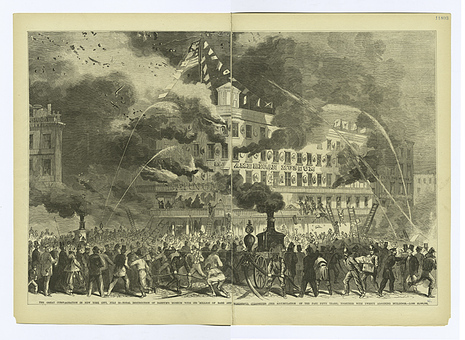 Anna Swan had to be rescued from a fire at Barnum's museum in July 1865. The stairs were in flames but she was too large to escape through a window. In her fear she bowled over the men sent to help her. Employees of the museum found a derrick nearby, smashed the wall around a window on the third floor, and lowered Anna by block and tackle with 18 men holding the end of the rope. At the time Anna weighed 394 pounds or 28 stone 2 pounds (179 kg). Usually however, her weight was around 25 stones or 350 pounds (159 kg). 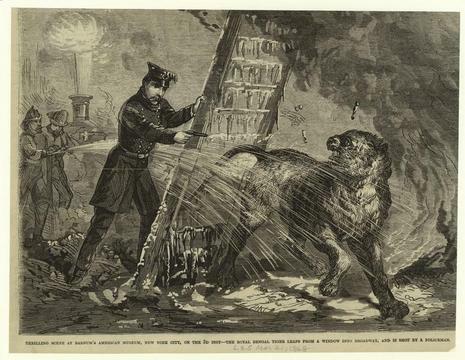 During the colossal fire at the new American Museum, some of the animals in Barnum's menagerie escaped into the streets of New York City. A tiger was shot dead in the street by a member of the New York Police Department.